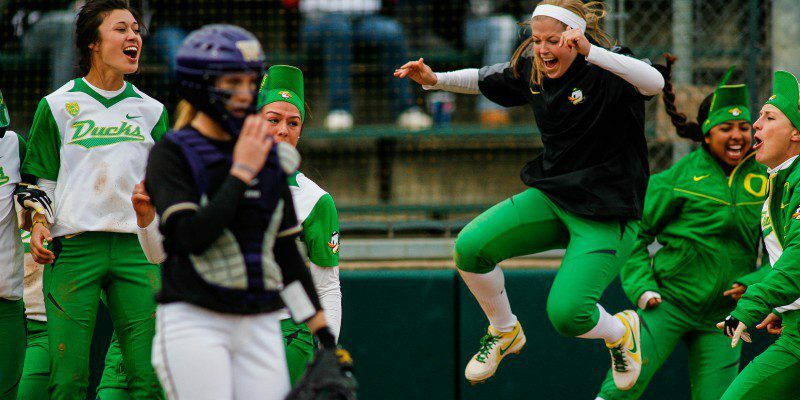 Ernie Banks once said, “Let’s play two,” but the Oregon Duck softball team slate of back-to-back-to-back double-headers over three days might have even exhausted the all-time great. The Ducks started the Kajikawa Classic in Tempe strong with shutout wins over Cal Poly, Texas and Northwestern, outscoring their opponents 27-0. The next two games were more competitive, but the Ducks beat North Carolina 8-5 and Wisconsin 10-2. The last game on the docket against was a nail-biter. Six games in three days can become like slogging through deep mud; players’ feet feel heavy, their arms are sore. At the end of four innings in the final game against the Nevada, Oregon trailed 8-7, but the the Ducks persevered and two newcomers sparked a rally that eventually won the game. Janelle Linvall singled in Hailey Decker putting the Ducks the lead 9-8 in the fifth frame and ace Cheridan Hawkins stepped in as a reliever to shut down the Wolfpack in the final three innings as Oregon won its sixth game of the season 12-8. Coach Mike White said of the Classic, “Going 6-0 in the opening weekend with several new players on the team was a good start. Cheridan pitched well in her games. Hovinga and Glasco combined to keep the opposition at bay. 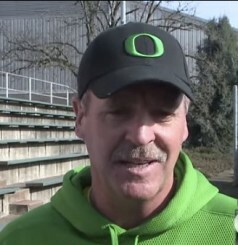 We played good defense for most of the weekend except for a few lapses this last day, but I attribute some of that to the high temperatures and fatigue.” With the victory, White became the all-time winning Oregon softball coach with 235 wins. A mix of fresh faces and established veterans sparked the wins in Arizona. Along with Linvall and Decker, White singled out Lauren Lindvall (Janelle’s sister), along with Gwen Svekis, Sammie Puentes and Danica Mercado. The strongest contributions came from true freshman Jenna Lilley who hit .526 for the series and had an outstanding slugging percentage of .737. She also stole three bases in the final two games. The Ducks return to Eugene for a week to practice and to rest their aching arms before heading down to Texas on a nine-day road trip which ends at the five-day Baylor Invitational. The Invitational will be highlighted by two games against No. 10-ranked Baylor and one against No. 21-ranked Tulsa. Sorry Ernie, no doubleheaders – only single games for the Ducks down in Waco.